A full node lets you access all state. There is a light node (state-on-demand) and wallet-only (no state) instructions as well, and these are even faster. I'm using this for dapp development, so I want access to all state. but does not execute the transactions. Instead, it downloads all the transactions receipts along with the entire recent state. As the node downloads the recent state directly, historical data can only be queried from that block onward. disk requirements. Mid range machines with HDD storage, decent CPUs and 4GB+ RAM should be enough. First, install the latest geth (1.7.3) to your machine. For Ubuntu, you can follow the instructions on the official wiki. Extract it and copy the geth binary to somewhere in your path. Unknown whether Parity works as well. It will probably take some finagling to work with the Geth-style Genesis block. At this point, you should probably start a tmux or screen session, so if you get interrupted during syncing it will still keep going in the background. SECURITY WARNINGS: We've enabled RPC and also loaded the personal module to allow testing and participating in smart contracts. However, if you do these things on a mainnet node with your unlocked wallet exposed to the internet, you could get hacked and all your monies stolen. I'll write a separate gist about a secure way to participate in a mainnet contract with real ETH. In a separate tmux pane or screen buffer or a separate terminal completely, create an account and save the password somewhere safe. After that, attach the console with the appropriate data directory. and create an account (substituting a much better password than notmyrealpassword). You'll see a different address than 0xb2e9fe08ca9a0323103883fe12c9609ed380f475. That one's mine, provided for illustration. Save your password in a secret place, preferrably encrypted. I use Evernote encrypted text, but you can use any password manager like 1Password, LastPass, Dashlane, etc. Leave that terminal open for now. Since I never use Google+ for social reasons with humans, I might as well use this for socializing with robots. You can go to http://plus.google.com and post publicly on any discussion board. Here's mine. Go to the Crypto Faucet section of https://rinkeby.io and paste it into the blank. Choose an option from the dropdown which corresponds to how much Ether you need and how frequently (requesting more Ether will take longer between requests). I requested 3 ETH in 8 hours. Don't worry, you'll get your ETH in seconds, but you can't request again for another 8 hours. This is to prevent spammers from swamping the network by overpowering it with mining power and then out-spending everyone else. You can also leave questions, comments, or feedbacks on this gist. hello please did you really get any Ether i tried the faucet but am yet to see the received ether in my wallet balance? Any idea what have I done wrong? Had no problem with this on ropsten. Works! Thanks for the detailed explanation. Super helpful! Thank you a ton for taking the time to write this out. I'm not able to get the nodes to start syncing. Anyone else run into this issue? Thanks iam-peekay and zubra5 i'll fix the writeup with your corrections. ujizzy make sure you are on the rinkeby testnet (networkid=4) when you check your balance, and that you created the address on that same network. also, check the Rinkeby blockchain explorer, not the mainnet explorer. Let me know if that doesn't fix it. geth --networkid=4 --datadir=$HOME/.rinkeby --cache=512 --ethstats="yournode:Respect my authoritah! @stats.rinkeby.io" --bootnodes=enode://a24ac7c5484ef4ed0c5eb2d36620ba4e4aa13b8c84684e1b4aab0cebea2ae45cb4d375b77eab56516d34bfbd3c1a833fc51296ff084b770b94fb9028c4d25ccf@52.169.42.101:30303 --rpc --rpcapi="personal,eth,network"
WARN [08-26|12:24:48] Stats server unreachable err="websocket.Dial ws://stats.rinkeby.io/api: bad status"
Haven't gotten any test ether, as faucet.rinkeby.io does not acknowledge my request. Nothing happens. https://gist.github.com/james18/0c59d6c5cafd750d82a1e7f46fc36bd5 is my gist file. Can someone pls share some test ether to: 0xE0020107EA4ce4a3d7223B82588E44bB7068f5ea Thanks! but miner is not supported as well. Should I start geth with --miner parameter? I also got the error "Invalid user... Boom". Can somebody describe what to do in this case? Hi towobola slava239 AI3EL can you paste the link of the gist you're submitting to rinkeby.io ? I suspect you might have a typo in the github username in that url. I got a "Stats login failed" the second time although the fist time all worked well. Any ideas anyone? Can not get ether, could anyone send to this account 9f3bdf37f348fb82fdd4cbcffc126c9282ef319a 10 ethers, Thanks!!!! I receive this issue with the rinkeby.json file..
@DalderupMaurice upgrade ur geth to version1.7. I solved it by upgrading geth. Hello friends of the chat, just a suggestion for those of us who are testing the Rinky test in the wallets. 1.- Ethereum people should give a value to ETHER of the Rinkeby network in order to better equip our nodes and help the Ethereum project. If we give Rinkeby an economic value of at least $ 100 we could acquire new mining equipment and continual hard disk capacity as nodes. What do you think the idea? Hi @ProyectsX I don't see how assigning a fixed value to Rinkeby ETH would improve nodes or help the Ethereum project. Right now new Rinkeby ETH is created in a controlled manner via Proof-of-Authority, so it's constantly being inflated in a slow way. From the faucet, I repeatedly get "No Ethereum address found to fund" message. one should put step 5 down and exchange it with another docu about getting ether for rinkby test network; or put this whole docu down, since rinkeby.io gives the warning : Github authentication discontinued at the official request of GitHub. Yes, Github no longer works, as of November 2017 you can use Google+, Twitter or Facebook. I chose Google+ and it worked. should I keep the blockchain sync up in the background? 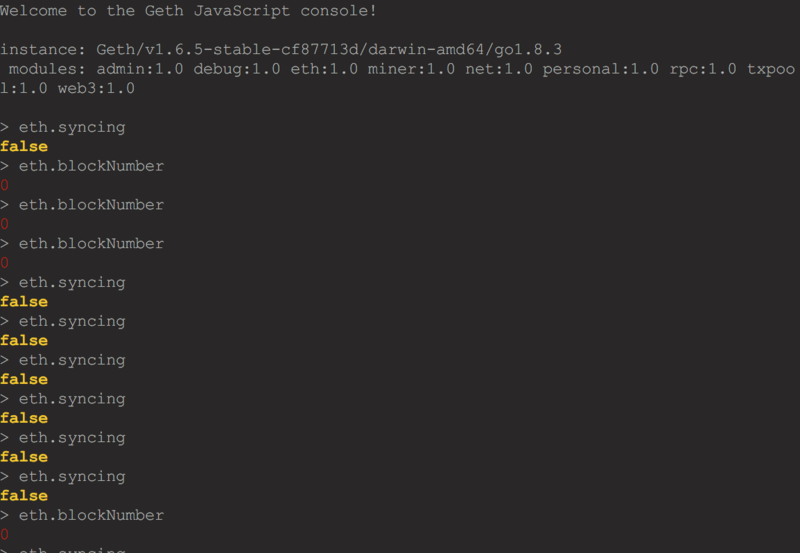 @itisha the new version of geth doesn't require this stats login. @ijkl123 great tip, it's been incorporated. can you paste the link to the social media post you used to request Ether? We can make sure the Ethereum address is valid. @hqblock. I have the same "zlib: invalid header" issue with twitter post - around a week ago everything was fine. I have tried Twitter, Google+, and Facebook. On Twitter, I hit the "Zlib: invalid header issue". On Google+ and Facebook, the Faucet web app simple responds "No ethereum address found to fund" Any ideas what I am doing wrong here? As of today, approximately how much space do I need on my HD to run a full node Rinkeby node? I've tried twice to get from the Rinkeby faucet and the transactions end in failure. The message as seen on Etherscan is "Value transfer did not complete, most likely as a result of a REVERT opcode." I cannot find information about this error as it pertains to a recipient (only w/r/t to senders). The address in question is 0xcb647a10db9a817e2ab32c9ae174723ce3dd35ba . So I was able to get the ETH from the faucet. HOWEVER - I need the ETH on a different address (didn't realize until I processed the faucet) - IS there any way to send the TEST ETH from the eth.coinbase address TO another "newAccount" address within Rinkeby? OR do I have to wait the 8 hours? I can't seem to find a way to send within geth. I also cannot seem to figure out how to display the "private key" for the eth.coinbase account that was loaded by default when setting up rinkeby, as I did not set a password for that account. Is there just a default password added by default? I followed the instructions down to the tee, and even though rinkeby told me my transaction went through and that I was funded, I still get a balance of 0 eth when i check using getBalance. I pasted my address to both google plus and twitter and each time the faucet told me the transaction went through yet my balance remains 0. Am I doing something wrong? hi @cryptogoth how to perform Step 3: Create an account, for Windows 7? RINKEBY TESTNET today pays this? for some reason when i call eth.getBalance(eth.coinbase) my balance is zero, i followed the steps provided. when i check my transaction its posted and shows online that i have 3 ether but my client does not? 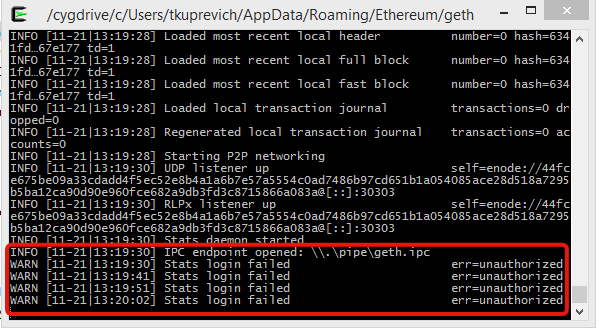 I had been looking for how to request ETH for days as "Start Mining" on Ethereum Wallet did not work. Your post really helped me. Many thanks! @tomb99 check the output of eth.syncing. If it returns anything but false then your node is still syncing the blockchain and your account balance will be zero until the block containing your transaction has been downloaded to your local node. When this article was written, the Rinkeby testnet chain probably could be sync'd in under 7 minutes. As of Feb 2018 though it will take much longer than this, probably several hours. @AdamJLemmon @cryptogoth Stuck at attaching the console on Ubuntu 16.0.4. I can get the sync started, open up another terminal and every iteration of attaching the console gets me "Fatal: unable to attach to remote......connect: no such file or directory. I tried to get some ether using the rinkeby faucet, but I didn't see any ether in my wallet. I'd tried many times. Could someone just send me some ether? Thanks in advance! 0x8C059309A8B892AA304e62267D241912bf4F4B2E. Here's the tweet I used https://twitter.com/thoslin/status/969032642787147778. Not sure why it didn't work. All the steps worked! Thank you! web3.eth.accounts.create([entropy]); smth like this which will return private keys? Until step 2, there was no problem. I did all things in this site. I have the same balance zero issue, but in Mist, it shows my balance number correctly. How come? I thought the wallet backend should be the same. Can you make a guide for windows? @birdca I am having same issue, did your find a solution? @hrachbkweb probably because that's a web3 v1 method and geth still uses web3 v0.20. Small note for those who might face the problem with --attach of ipc on Ubuntu. You need to replace the $HOME/.rinkeby with $HOME/.ethereum/rinkeby. 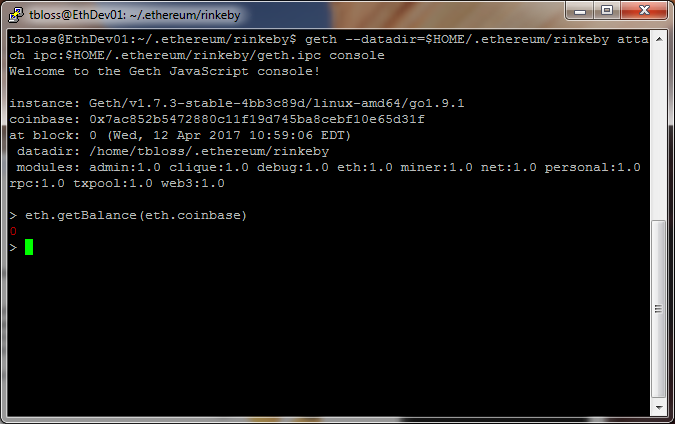 The rinkeby directoy is in .ethereum folder. It would sync in less than 10 minutes if you are using SSD. I you use HDD, the sync probably would not finish. I can see ether in my account on "https://rinkeby.etherscan.io" but when i run eth.getBalance(eth.coinbase) the result is 0.
anyone facing the same issue?? @aib92: can you check the current status of your node by command eth.syncing? these instructions are good but too old. need to be updated. @RolandBarro Have you finished to sync blockchain? If it is 0 then you are not in sync with the network yet, so your balance cannot be calculated. I could not sync to the network. I have already check your syntax: "eth.blockNumber" and I get 0. How can I sync to the network in order to be able to calculate my balance? For me the balance still shows zero in eth.getBalance but it is updated in the rinkeby site as 3 ethers. Please a guide or video for windows 10, detailed, to be able to support Rinkeby. Please write privately to announce grants.